When setting up a start-up in the ‘software for domain experts’ space, one challenge is targeting the right size market, said Aristos Doxiadis, partner of OpenFund, a company based in Athens which invests seed capital in software start-ups. But conversely, if your market is too general, then it might be too easy for someone else to copy if you succeed. If your target industry is a large industry where many people work in the same way, “then it’s likely that the workflow can be standardised and monitored with generic systems,” he says. One advantage of specialist software is that domain experts are more willing (or comfortable) paying for tools which solve specific challenges in their business, than they are paying for more general productivity tools, which they can often get for free in the cloud. To be successful, you probably need to have deep domain knowledge within your software company. “I have never seen a start-up trying to solve problems like the ones I outlined, who have not had at least one of the team with direct experience of what they are trying to do,” he said. Also, as a specialist software company, “you can become a leader in that field without having to spend huge amounts on marketing and sales,” he says. Experts typically “gather data and analyse data in a very particular way that is usually not compatible with enterprise software,” he said. Also, “what they want to optimise is not obvious to an outsider, and not obvious to someone not doing the job with them,” he said. Mr Doxiadis would characterise software being for ‘domain experts’ if it was designed to serve a particular industry (sometimes called an ‘industry vertical’). He suggested four examples of ‘software for domain experts’. In aquaculture (fish farming), when employees feed fish in tanks, it is critical that they record a number of observations, including at what level of the tank the fish are swimming in. If they are swimming close to the surface they are probably not being fed enough food. Beekeepers have to record data when they open beehives, but are wearing heavy gloves at the time, so need a computer interface which can be used with gloves on. Vineyard operators sometimes plant roses because they are an early indicator of some types of fungi, which may develop on the rose before affecting the vines. The data about fungi can be gathered to make plans to remove the fungi. Jewellers might make a bracelet with precious stones, where each one has a different weight and shape. “It is not easy using any sort of Enterprise Resource Planning (ERP) software to classify, tabulate the material they buy or the combinations they use,” he said. The measurements of the stones come with tolerances (error bars) which need to be included with the data. The data also needs to record when the stones are purchased and then they are included in a bracelet. OpenFund has not invested in any of the above examples, but it has invested in three companies which could count as “Software for Domain Experts”, Discoveroom, Workable and Intellicent, he said. Discoveroom is a system for owners of small rental properties to keep track of their reservations using smart phones, for property owners who do not have a dedicated office. Many lodging owners are not working full time in their properties. They might be farmers, have winter jobs as lawyers, or run a café. With Discoveroom, any time the owner receives a request, he can see if the room is available on his phone and tabulate the booking. The user interface “is the best in the world,” he said. Workable is a tool for small companies, who have no HR department, to manage the staff hiring process. For small companies, hiring “is a pretty complicated process,” he said. “You have to put out the ad, get out the CVs, compare the CVs, talk to people in the company so you see the same people, exchange notes”. Workable also makes it easier to compare CVs, even if they are in different formats, such as a LinkedIn CV, a specially made pdf file, or from filling in a form on a job board. The software can tabulate key data about candidates, such as how many years’ experience they have, what type of jobs they were in. “Workable found a way to parse the data in the various formats of the CV to make it easier to compare,” he said. This is a specific function which can be very messy, and so hard to manage on non-specialised software, he said. OpenFund has also invested in Incelligent, a company which makes software for mobile phone network operators to optimise the energy supplied to the network. It can make predictions of how much transmitter power will be required, based on history and future events. This enables operators to (for example) decrease the power to the transmitters at times of low demand, and have higher power available at times of high demand (for example if there is a football match happening nearby). “They gather data from diverse sources, about the weather, or sports events, as well as from the network itself, and developed a model for predictive analytics,” he said. OpenFund typically invests between Euro 100,000 and Euro 750,000 in a company. It is one of four funds which are active in Athens at the moment “working more or less the same way,” he said. So far OpenFund has seen more than 3,000 ideas sent by e-mail, and had face to face discussions on about 300 of them. Some of these ideas could count as “Software for Domain Experts”, he said. Different investors are looking to make investments of different sizes. For example, some Silicon Valley investors will only invest in business they think could be worth a billion dollars, known in the jargon as a ‘Unicorn’. “They will not invest in businesses where the maximum likely valuation is $50m or $100m. They think, they will have to spend a lot of money in the later stages of growth of the company,” he said. It may might make sense to look for people who understand the specific industry sector, for example people or companies in the telecom, farming or aerospace industry, who have money to invest. If you need larger amounts, there are venture capitalists outside Silicon Valley who are interested in ideas which could be valued at $100m. “There are VCs like that in Europe. You can get funding in the range of a few $m,” he said. If you can get loyal clients for your business after a “few million dollars” investment you can be self-sustaining. Investors will usually be looking for an exit path, because investors are unlikely to be satisfied with dividends alone, he said. This means there must ultimately be someone willing to acquire the company for “tens of millions of dollars” as a trade sale. “We in VC tend to call these businesses ‘lifestyle’ businesses. On the question of Greece, Mr Doxiadis said that software engineers in Athens are a third of the cost in London, or a fifth of the cost of Silicon Valley. A disadvantage of Greece is that “the graduates of good Greek universities have got no practise in software engineering, although they are very bright and well trained in theory,” he said. Graduates haven’t had experience producing software modules within a certain time frame, or in how to develop software so that it is easy for someone else to take over the work, he said. Consequently there is a shortage of experienced software engineers in Athens, meaning people with over 5 years of experience. Start-up companies typically look for the brightest people in schools such as Athens University of Economics and Business (AUEB) and teach them the practical skills on the job. There are much better ways to build software which can make a useful contribution to experts’ lives, said Roger Schank, CEO of Socratic Arts, and perhaps a good place to start is story telling. Mr Schank’s company Socratic Arts develops performance improvement solutions for companies. He is also CEO of XTOL Corp, a company which offers technology career programs. He is Professor Emeritus of Computer Science, Psychology and Education at Northwestern University, Illinois (USA), specialising in artificial intelligence, learning theory, and cognitive psychology, and a former chief education officer of Carnegie Mellon University’s Silicon Valley campus. Mr Schank presented a video of Dimitris Lyras, the chairman of the conference, telling a story from several decades earlier of how his shipping company had a ship delayed in a port in the Caribbean. The crew went fishing for barracudas, which were fried, roasted, boiled and eaten onboard. Unfortunately the barracudas were poisonous because of the plankton they eat. The poison can be lethal. None of the crew died but some had to go to hospital onshore and be sent home, and the ship left the port without an electrician onboard. This story is irrelevant to nearly everybody, Mr Schank said. But if you were running a ship which was entering the Caribbean, the ship was going to be there for a while, and someone takes out a fishing rod, it would be a good story to know. Meanwhile modern computer software, and the systems we use to run our organisations, is nowhere near being able to provide this information, or this story, at the right time. People are usually asked to go on a course or read a manual to learn what to do. It is not hard to find similar examples. Mr Schank presented a video of a US solider who had been asked to help set up a school in Afghanistan, working with someone locally. The soldier can follow orders but has no idea how to do it. But there might be someone else in the army who has done it before. The organisational challenge for the US Army should be connecting this soldier with stories from the soldier who has done it before, Mr Schank said. A further example was of a ship going through the Suez Canal which had a fire in the boiler room. The chief engineer started to shut down the engine, as per the instructions in the manual. The captain told him that was a crazy thing to do. The ship would be hit by the ship just behind it in the canal. If it entered port, the authorities might demand a bribe or try to steal the cargo. The point here is that we are still dependent on having the right person standing behind us at the right time to provide us with relevant advice. Software ought to be able to bring us the right story at the right time, but in 2015, it can’t, Mr Schank said. Yet as people, all of us are experts at this. “That’s what we do,” Mr Schank said. “We say something, and someone says, ‘that’s what happened to me’”. So bringing up the right story at the right time could be considered a reasonable definition of what ‘human intelligence’ actually means. Mr Schank is recognised as a world expert in the field of ‘artificial intelligence’. Yet he has become very disillusioned by the field, he said. Consider IBM’s “Watson”, a computer system developed by IBM to answer questions on the US quiz show ‘Jeopardy’, and won a $1m prize, competing against former winners. Watson is claimed to be an example that ‘artificial intelligence’ could now be better than human intelligence. But there is also an argument that Watson is nothing more than a search engine, Mr Schank said. As an example, one of the questions in the Jeopardy show was, “It was the anatomical oddity of U.S. Gymnast George Eyser, who won a gold medal on the parallel bars in 1904.” Watson gave the answer ‘a leg’ which was counted as an incorrect answer. What Watson probably did, Mr Schank said, is look at the Wikipedia page for George Eyser, which said “Eyser competed with a wooden prosthesis for a left leg”. Watson could understand that the answer had something to do with a leg, but all of its artificial intelligence power was not able to connect the phrases “anatomical oddity” and “wooden prosthesis”. It is important not to confuse statistical analysis and pattern generation, which computers can do better and faster than human, with the deeper pattern generation which humans can do, and this is probably what ‘intelligence’ is, he said. You should also be wary of technology companies making marketing claims that their products are ‘intelligent’ when they are nothing of the sort, he said. One computer training company claims to offer the ‘future of study’ by automatically creating study aids using content, he said. On closer inspection the software seem to just find content on Wikipedia relevant to what you want to study, serves up some text with some words deleted, and asks students to fill in the blanks, he said. There seems to be a growing belief in society that expertise is something you can get from text books, not something you gain from experience, Mr Schank said. But you don’t need a text book to “do what I’m doing right now, having an idea and talking about it,” he said. Mr Schank demonstrated software built by his company Socratic Arts for assessing people, which could work just as well for finding professionals (for example a doctor), finding a life partner (a date), or finding an employee for your company. People who would like to be considered as candidates (as your doctor, date or employee) record videos about themselves answering questions about important topics, such as how they dealt with a tricky situation (a doctor) or why they want to be a programmer (a potential employee). Watching someone on a video, we can usually make a judgement about them in a few seconds. And whether our judgement is good or bad, it will probably be the same judgement we would have made after a 30 minute face to face interview, which is far more time consuming. There is still light computer processing involved – the computer can spot patterns in the type of rankings different videos get, and use this to (for example) bring you someone very different to the last person you saw, or very similar. Compare this to other software tools on the market which try to use computer algorithms to suggest you a life partner who would be a good ‘match’, but have only text answers to go on, such as ‘I like to laugh a lot’. In today’s society, the best way we can find a professional to help us (for example a psychotherapist or doctor), is by looking at online profiles people have written about themselves on websites, which are not usually very helpful. Mr Schank was a graduate of Columbia Law School, and was on a work experience placement together with a graduate of the less elite New York Law School. “I made sure to give him all the junk work,” Mr Schank’s father would say. The graduate of New York Law School went on to be Chief Justice of the State of New York. You can see why a father might want to tell this story to his son if his son was being a bit cocky, as a sign that hard work and humility might take you further than arrogance. It is also a story which would be good to hear at the right time. “We don’t always have the right guy to tell you something at the right moment, but you could,” he said. Another problem with most enterprise software is that it is too complex, he said. Consider that most organisation education software products allow you to upload as many PowerPoints, videos and documents if you want. But the best education software might do none of this – it would just give students one task to do, and once a (human) teacher agrees it is completed, the teacher will put you onto the next task, and provide assistance as required. This software might not be commercially successful though. “Teachers prefer talking,” he said. Also the educational establishment might not like this idea, because educational professionals often don’t understand the concept of goals, he said. But in the educational world, the emphasis is usually on ‘creating courses’ or trying to cover topics, he said. Similarly in the Artificial Intelligence world, many companies talked about trying to build ‘general problem solvers’. Mr Schank always argued that this was impossible. “People who are good at solving problems in one area not good at fixing problems in another area. The idea that there must be such a thing as general problem solvers, it is simply wrong,” he said. George Karaplis – low code – an inflexion point? Perhaps we are under-estimating the impact which ‘low code’ technology could have on the software industry, said George Karaplis, senior associate with IG Icon Investments. Mr Karaplis is a senior associate and Investment adviser to I.G. Investments, a private investment and consulting firm. He has served as Chairman and board member of Netia ( Poland), general manager in Group Suez’s water division and chief financial officer and vice president of international investments for the Hellenic Telecom Organization. He worked for 15 years in Canada and the US in various management positions. In recent years there has been something of an acceleration in the use of ‘low code’ tools, which enable the rapid building of applications with minimum hard coding, he said. Forrester Research recently published a study saying they are mostly used in customer facing applications at the moment. Roughly speaking, you build applications by making a diagram of your process in your software, and then the ‘low code’ tool creates the code automatically. An analysis by Capgemini found that the average time to build a ‘function point’ in low code is 2.5 hours, compared to 10.6 hours for Java and 15.5 hours for C#. Mr Karaplis is an investor in a company which builds software for African markets, which will work over low bandwidth mobile and satellite communications. Mr Karaplis envisages that software developers could also develop templates and libraries, which could be re-used in different software applications, speeding up programming time in the same way. Consider a shoe manufacturer who has custom built sales software for managing transactions with retail outlets, and the manufacturer starts selling in a new territory where it is customary for manufacturers to sell to distributors, who then resell to retail outlets. Instead of the software requiring extensive manual coding work to incorporate the distributor, it would be possible to just upload templates of ‘low code’ and the change in the software would be implemented, he suggested. In another example, Mr Karaplis was working for a large company (as an employee) and was asked to arrange IT support for the company’s 45 subsidiaries around the world. He signed a large contract with a supplier to provide it, and the company spent 6 months “going to countries and supposedly building things,” he said. But then Mr Karaplis found that all the subsidiary companies had been developing their own IT projects on the side, which was feeding data into the main corporate IT system. The locally built software was proving much more capable at coping with local requirements, including tax and regulations. But in future, companies might use ‘low code’ to build different tools for their subsidiary companies much faster, which all feeds into a larger system. Low code tools could also make it easier to facilitate data sharing between departments of a large company. Low code tools might also help change company structures, so you can have small teams developing and using their own software, he said. Low code could be very valuable for small software companies. “It’s a cheap and relatively inexpensive way to develop a platform,” he said. A possible business model is that domain experts can work for, or set up, a small company and put together a software tool to do something useful, perhaps working together with programmers. “They take their brains, they put it in a model,” he said. However it can be difficult for small software companies to sell to large company customers. It may be worthwhile creating umbrella organisation with a number of small software companies serving a certain sector (such as banking). This means you appear to the buyer as a company selling a whole portfolio of products, he suggested. When selling to big companies, you often face a ‘herd mentality’ problem where buyers only want to buy software someone else is using. Another challenge is the organisation’s dreaded IT department, who will often be the people who make the final decision whether the company will use your software. “IT departments can be your friends or your enemies,” he said. The best way to make friends with the IT department is to develop software tools which will improve the company’s relationship with outside customers, because that way the impact of the software will be felt much faster through the whole company. Or you can provide tools which enable the IT department to respond to request from the company’s sales force or marketing staff. Selling to IT departments can be a long process. “They have to look at the application, test it, then they have to go and get money. You’re talking to 6-9 months a year,” he said. And also bear in mind that for the company to take benefit from your product, they may need to stop using something they are currently using – and this could lead you to make enemies of people who are invested in the current software, he said. When asked how Greece could do more to support its software industry, Mr Karaplis said that there could be more co-operation between industry and universities. “We don’t have that here,” he said. Greece also makes a very low amount of investment in research, ranked 154 in the world, he said. Uganda spends a similar amount of its GDP on research as Greece, 0.6 per cent, he said. The introduction of low code tools could make a massive change in the way software is built, said Dimitris Lyras, director of shipping company Lyras Shipping and software company Ulysses Systems, also chairman and co-producer of the conference, in his opening remarks. Mr Lyras’ company, Ulysses Systems, builds software for shipping and transactions. These “are built on conventional software architectures of entity, relationship databases,” he said. The software “hasn’t been easy to maintain,” Mr Lyras said. But also it is hard to imagine any enterprise software built using conventional means being easy to maintain, especially if it is doing something significant. If software is expensive to build and maintain, it means that many start-up companies struggle to get good software made, and many companies are reluctant to change software once they have built or purchased it. All of this could change with the advent of ‘low code’ software tools, which promise to be able to automate the task of building software. This should make it possible to build software much faster and cheaper, and the software will be more reliable immediately, so less expensive testing required, Mr Lyras said. Building such software could be a massive opportunity for Greek software companies and software engineers. There are many people in Greece qualified to work in software who are currently unemployed or underemployed. Mr Lyras gave one business idea, a tool which can be used to make business predictions, but also keep track of what assumptions were made in the process. For example, he once asked a financial expert to build a model estimating future demand for shipping services. The most obvious software to use for such a task is Microsoft Excel, but Excel does not make it easy to see what assumptions were made in building the model, and makes every figure look too exact. Could it be possible to build much better software for domain experts – and could there be many business opportunities along the way for organisations which employ domain experts, domain experts, software companies large and small, and investors? 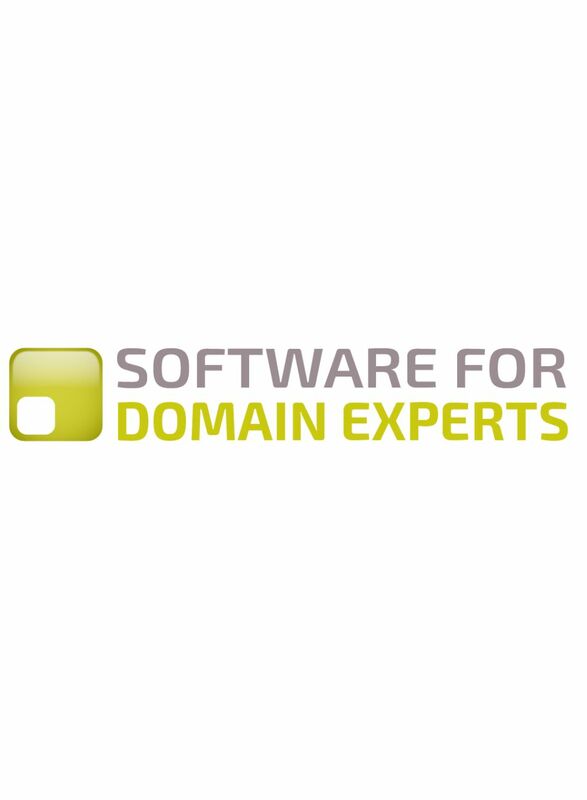 This is the topic we explored in our Athens conference at The Cube, October 29, 2015, “Software for Domain Experts”. By ‘domain experts’ we mean someone who is an expert in a particular field or domain, and has a job role where they use this expertise as part of an organisational process. So, they could be in anything from fish farming to running a government department. Our starting theory is that many of these people could do far more with software, given current computing capabilities, than they currently do, and modern enterprise (organisational) software does not serve them as well as it could. Much enterprise software has been built to process transactions or manage ‘workflows’. This is excellent if it is built for users who do manage transactions or have work which follows the same steps every time, for example managing a billing or purchasing process, or approving mortgage requests in a bank. But most expert roles are very “messy”, in that people don’t work in a standardised way every time which you can copy into a flowchart and embed in ‘workflow’ software, or they gather and analyse data in a very particular way which is usually not compatible with enterprise software. The ideal software for such an expert might be built in a very different way to standard enterprise software. Its main focus could be providing the expert with information relevant to what they currently need to do, and providing them with relevant experiences – for example a story from an expert who was in a similar situation, talking about what they did. The software still needs to make sure their work fits with the business processes, but perhaps in a less restrictive, or more goal-centric way, than current enterprise software usually allows. This requires software to be made in a very different way to how software is currently made. At the conference we identified several factors which might help. To provide relevant information, the software would need to be built with sophisticated modelling, which understands what the expert is currently doing, what they need to know, and what organisational data would serve them best. To provide ‘relevant experiences’, perhaps you would record many people speaking about their experiences, their opinions, or themselves, in video form, which is much easier to learn from, and make judgements from, than written text. Or perhaps you would employ journalists to record people’s stories. The software might be built using ‘low code’ software technology, which aims to automate much of the process of writing code, and enables you to create code which is more robust and requires less testing – thus reducing the cost of creating software and enabling software to be adapted easily once built. An enormous amount of modelling would be required – building models of the business process, building models of the information an expert requires, building models of how the software would work together. All of this could create big business opportunities for Greece. Building and maintaining such software could be a task better suited to small start-up companies, which would each serve a narrow sector, and so many new companies could be created. Greece could also become a centre of excellence for researching and providing the necessary modelling skills, which no-one anywhere in the world has yet figured out how to do. And meanwhile consider that so many of the world’s biggest problems might be solved by experts supported by better software as part of a looser business process. Climate change, counter-terrorism, refugees, cybersecurity, maintaining water and electricity supplies in developing countries, providing universal high quality education, not to mention corporate challenges such as running complex organisations, managing complex infrastructure, avoiding accidents, and making sure your company doesn’t run out of cash. The ‘internet of things’ movement – adding billions of sensors – will also generate much more data – and generate much more requirement for non- transactional expert work to make use of it. Our conference in Athens on October 29th explored all these issues. Our opening speaker, George Karaplis, a former CFO of Greek telecom company OTE, explained what he saw as the business case around ‘low code’ and how to build a business with it. Our second speaker, Roger Schank of Socratic Arts, and one of the world’s top experts on Artificial Intelligence, explained how to include stories as part of a software package – and how to make people love your software much more. Our third speaker, Aristos Doxiadis, a well-known Greek economist and investor in software start-ups, gave valuable advice on how to get a start-up software company thriving in the current environment, in the software for domain experts space. This was followed by three speakers from academia – Vassilis Zafeiris of Athens University of Economics and Business (AUEB), Kostas Kontogiannis of the National Technical University of Athens (NTUA), and Nikitas Assimakopoulos of the University of Piraeus, who talked about academic work to improve modelling and develop more flexible enterprise software structures. Finally, we had three case studies of Greek (or partly Greek) software companies in this space: Payment Components, which makes ‘low code’ tools to make it easier to build financial transaction software, Sensorflare, which makes tools to make it easier to connect ‘internet of things’ devices, and B2B Wave, which makes it easier for small business owners to build online stores.